The PICBASIC PRO™ Compiler is the easiest way for you to program the fast and powerful Microchip Technology PIC microcontrollers. PICBASIC PRO converts your BASIC programs into files that can be programmed directly into a PIC MCU. PBP is compatible with Windows 98/Me/NT/2000/XP/Vista/7. It supports over 300 of Microchip’s PIC microcontrollers, including the very latest releases. From the tiny, inexpensive 6-pin parts to the immensely powerful 100-pin parts, PBP allows you to choose the microcontroller that best fits your application. Used by thousands of engineers, students, and hobbyists for more than a decade, the PICBASIC PRO Compiler is one of the most popular development tools ever created for the PIC microcontroller. Now with 32-bit signed math! A new 32-bit version of PBP (PBPL) is included that offers BIT, BYTE, WORD, and LONG (32-bit, signed)* variable types. This LONG version is intended for use with the PIC18 family devices. When working with LONGs, the mathematical operators return signed results in 32-bit, twos-complement format. This allows storage, calculation, and display of values from -2,147,483,648 to 2,147,483,647. The mature and familiar 16-bit WORD version has been retained as a separate application that supports the Microchip PIC10, PIC12, PIC14, PIC16, PIC17, and PIC18 microcontrollers. This insures that PBP will remain completely backwards compatible with existing programs. It also allows you to produce code that is better optimized for the smaller devices with fewer resources. 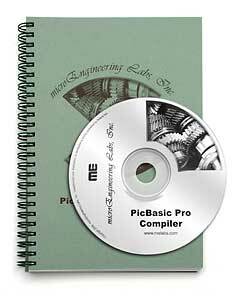 The PICBASIC PRO Compiler software is shipped on CD with a printed manual. The CD includes the standard version of the MicroCode Studio editor/interface software for Windows. This powerful development environment features color-coded syntax, left-pane code explorer, single-click compile and program, and many more convenient features. For in-circuit debugging capability, MicroCode Studio Plus may be purchased separately. A command-line version of PBP is included for integration into your choice of editor software (including MPLAB) or for use in a command-prompt window. The PICBASIC PRO Compiler gives you direct access to all of the PIC MCU registers – I/O ports, A/D converters, hardware serial ports, etc. – easily and in BASIC. It automatically takes care of the page boundaries and RAM banks. It even includes built-in commands to control intelligent LCD modules. Floating-Point calculations are possible with downloaded routines. The PICBASIC PRO Compiler instruction set is compatible with the BASIC Stamp II and Pro uses BS2 syntax. Programs can be compiled and programmed directly into a PIC MCU, eliminating the need for a BASIC Stamp module. These programs execute much faster and may be longer than their Stamp equivalents. They may also be protected so no one can copy your code. The PICBASIC PRO Compiler can create programs for most of Microchip’s PIC microcontrollers and works with most PIC MCU programmers, including the melabs U2 Programmer. A printed manual and sample programs are included to get you started. The PICBASIC PRO Compiler can also be used inside Microchip’s MPLAB® IDE. This allows you to use Microchip tools for source-level debugging. More information is available the MPLAB installation help page. PICBASIC PRO Compiler has limited support for the 12-bit core microcontrollers. If you are a current PICBASIC PRO owner and would like the latest version, please see the upgrade page for upgrade information. demo version of PICBASIC PRO™ Compiler supports a limited number of PICmicro® MCUs and is limited to 31 lines of source code (comments and whitespace are not counted). You may use this download to evaluate the compiler before purchasing the full version.